Take oliveoil,lemonjuice,salt and pepper and whisk well for dressing. Heat Olive oil in a pan and fry the onion till tender. Take fried onions in bowl and add bulghur wheat with hot vegetable stock. Let it be for 20 minutes until it is cooked. 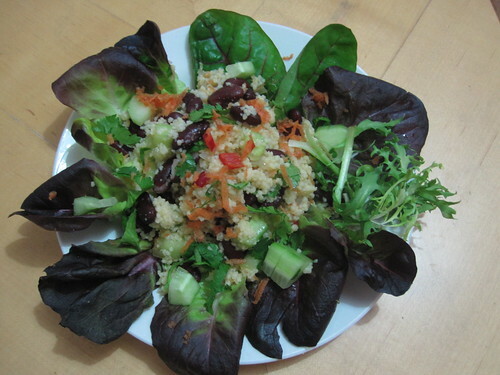 Separate the grains with fork and add kidney beans and cucumber. Now add carrot and coriander leaves and mix well. Then add celery and red pepper and pour the dressing over it. Mix well and serve with salad leaves. This Wheat and Bean Salad can be served as evening breakfast. 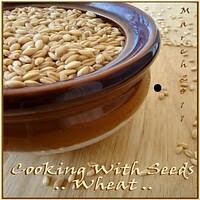 I am also sending this salad to Cooking with Seeds Event. Looks so delicious, lovely combination. Such a healthy and filling salad, yumm! What a nice salad, Ila! Love the wheat and kidney beans in it - Did you make your own veggie stock or was it store bought? Very healthy salad, looks lovely. So lively, healthy, and colorful. An easy and satisfying salad. Very healthy indeed, sounds delicious too. 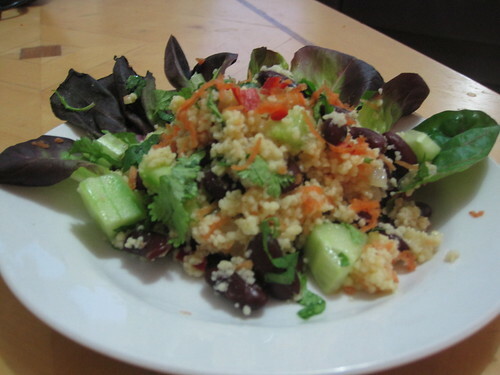 I love bulgur wheat, but don't cook with it often. Your salad looks delicious, will give this a try soon. Another healthy salad! I never tried bulgar..